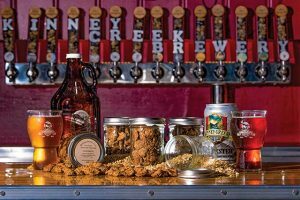 A five-gallon bucket of spent grain was a donation from a friend who brewed his own beer, and it started John Krumm’s journey to his Barking Dozen dog treat enterprise. It was another chance meeting with a friend at Kinney Creek Brewery in Rochester that led Krumm to his main source of grain. Talking with the bartender, Krumm found out Kinney Creek often provided farmers with spent grain, and he made arrangements to add some of their grain to his process. The treats include just three locally-sourced ingredients: spent grain from Kinney Creek, cage-free eggs from a Orpington Acres in Dexter, Minn., and King Arthur unbleached all-purpose flour. “I figure if you’re putting in good stuff, don’t skimp on one of them,” Krumm said. Licensed by the state of Minnesota as a pet food manufacturer, Krumm makes the treats when he can fit in time. Most of the labor is in the preparation, getting the treats on the pan, then baking and drying them. Start to finish, the process takes him about five hours. Printing labels and traveling to pick up the grain and eggs adds time too. Barking Dozen dog treats treats are sold at Kinney Creek and the Anytime Fitness on Broadway. They are packaged in mason jars with 60 treats for $8. There is a magnet under the seal of each jar to remind you where you got your pup’s treats. You can see Krumm’s real reason comes from something deeper than just the challenge of extra grain and a few recipes. Being a baker and purveyor of puppy petit fours comes from being an animal lover. Krumm lives with three pets of his own. Bella, 11, is a Lab mix. Jimmy, 10, is a former stray cat. The most recent arrival is a calico kitty named Vixen. All are rescues of one kind or another. Anna Matetic is a local freelance writer and animal lover. She is always looking for new animals stories in person and online.